Paint and sheet metal weren’t the only things traded this week following the crash-filled playoff race at Talladega Superspeedway. 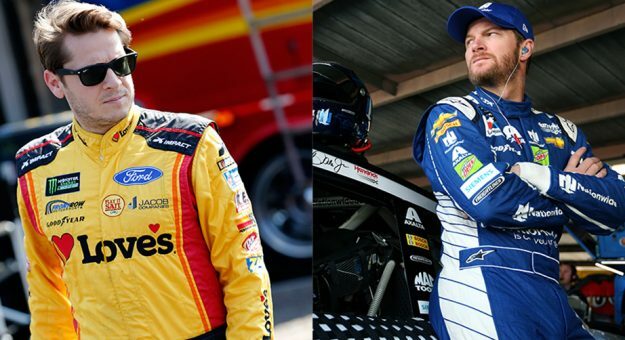 A flurry of 140-character jabs flew between competitors, too, when Dale Earnhardt Jr. and Landon Cassill openly discussed their drafting practices on Twitter. It started Sunday when Dale Jr., making his final Talladega start, didn’t quite get the drafting help he was hoping to receive from Cassill — making his frustration known over team radio. In the end, Junior contended for the win after navigating through a series of multi-car crashes, including the Lap 173 “Big One” that ended Cassill’s day (and involved upwards of a dozen others — many of them playoff contenders). After the race, the two traded barbs on Twitter (playful barbs, we think). I think should @landoncassill get another shot in great equipment he would get it done. His talent has improved over the last few years. …but things are different now.